Heading into harvest, precipitation totals were right on track with the 15 year average. This chart shows 2018 accumulative precipitation totals for Ackley, IA compared to the 15 year average. On September 1, 2018, Ackley totaled 29 inches of rain, same as the 15 year average. By October 12th, precipitation totaled 40.51″ compared to 32.69″ on the 15 year average. That’s 11 inches in 6 weeks! Here are Climate Fieldview’s precipitation totals from January 1, 2018 to October 12th for the surrounding communities. 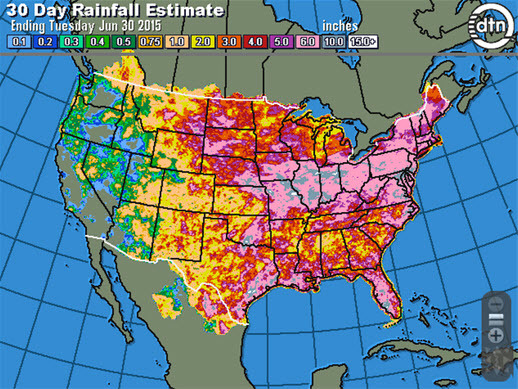 Many farmers like to keep track of precipitation to project yield potential of their crop. I like to compare the current precipitation to historical averages. This helps me put a number the terms “dry”, “wet”, or “adequate”. As we start the month of July, I wanted to give you an idea of how “dry” our area is. Here are local season to date precipitation compared to the 10 year average. The (-) represents short of the 10 year average. I used to log on at http://www.climate.com and run a comparison on the past weather tab. It took time to do this on every field and I needed access to a computer. Now it’s very easy to access this information on your fields. When you log on to the Climate Fieldview App on your smart phone, an Overview screen will appear. Tap on Rainfall. It will default to the Last 24 Hours precipitation. To the right, tap on Season to Date. You will then see if precipitation is above or below normal compared to the 10 year average. Categories: Climate.com, Uncategorized | Tags: Climate.com | Permalink. As we approach the 2016 crop season, farmers realize we have had a wet winter and are trying to manage the impact of wet winter soils. Wouldn’t it be nice to know how wet it was compared to normal? 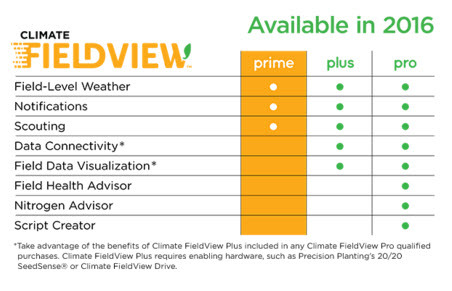 Climate Fieldview Prime provides accumulative precipitation on a field level basis. Let’s take a look at a field near Ackley, IA. The accumulated precipitation graph starts on November 1st and ends April 3rd. During this time period, Ackley has gotten 15.42″ of precipitation. The orange line on the graph represents the average rainfall over the last 30 years, 7.33″ of precipitation. We have received more than twice the average precipitation this year. How to see accumulated precipitation on your fields. All fields mapped in Climate Fieldview Prime have this weather information available to view. On a desktop computer, simply click on a field and “View Full Forecast”. Then click on “Past Weather” in the upper right hand corner of the screen. The accumulated precipitation will now appear on your screen. The date range is defaulted to the crop year, but it is easy to customize the date range in the upper left hand corner. To see the 5 year, 15 year, and 30 year average precipitation for the same date range, click on the compare box in the upper right hand corner. Contact Betsy to set up a free Climate Fieldview Prime Account. Weather data is valuable information to help make in-season management decisions on your farm. Categories: Climate.com | Tags: Climate.com | Permalink. The Scouting Feature can be used for more than scouting notes. You can use this section to make notes about chemical and fertilizer applications. Having record of applications is good when analyzing field performance. Plus, the Climate account makes it easy for you to look back at weather conditions at the time of application. The Data Manager can track planting activity, tillage practices, manure applications, and soil characteristics. I am sure you store this information in your head, but this way you can record and share this information with others involved in your operation. The Hail Notification alerts you of possible hail damage on a field level basis. Don’t leave Crop Hail Insurance money on the table! The Weather Forecast provides you with hour-by-hour chance of precip, wind speed, and conditions for the next 7 days. Having field level weather forecasts can be helpful in developing your fieldwork schedule. The Past Weather provides a quick reference to the last 24 hour and 72 hour precip. You can also view accumulated precip throughout the growing season. Being able to compare this season to past seasons and historical averages is useful information to have at your fingertips! If you utilize the FREE Climate Fieldview Prime account, you will have useful data to aid in making operational decisions. Useful data adds value! 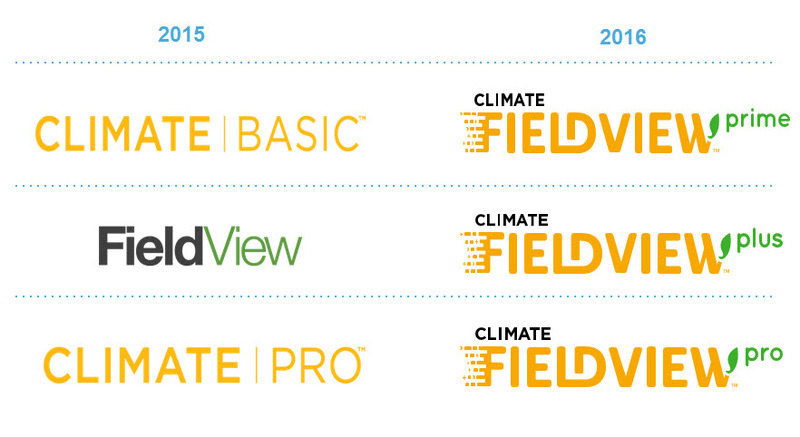 Climate and FieldView have joined forces to offer you one account for your data collection and utilization. You can select from 3 different tiers: Prime, Plus, and Pro. Below, you can see that in 2016 the Climate Basic will be called Climate FieldView Prime. The Climate FieldView Prime account is free and provides you with valuable information to manage your farming operation through Field-Level Weather Data, Notifications, and Scouting Notes. The more you use the Prime account, the more valuable it becomes. The Climate FieldView Plus and Plus accounts can provide even more value with the Data Connectivity, Field Data Visualization, Field Health Advisor, Nitrogen Advisor, and Script Creator. I would like to work with you to find how Climate FieldView Accounts can be a valuable tool for your operation. For more information about these features contact me or visit Climate’s Blog. Yesterday I listened to DTN’s Quarterly Stocks and Acreage Update webinar. They showed a Rainfall Map for June 2015. I found this interesting as we hear about weather concerns in the eastern cornbelt. As much as 10-15 inches of rain fell in some areas. You can see that central Iowa has seen 4-6 inches of rain in June. Categories: Climate.com | Tags: Climate Basic | Permalink.